Library image #1946: Sunset on Mt. Emerson along the North Fork, Bishop Creek in the John Muir Wilderness. The United States Congress designated the John Muir Wilderness (map) in 1964 and it now has a total of 652,793 acres. All of this wilderness is located in California and is managed by the Forest Service. The John Muir Wilderness is bordered by the Ansel Adams Wilderness to the northwest, the Dinkey Lakes Wilderness to the west, the Sequoia-Kings Canyon Wilderness to the south, the Monarch Wilderness to the southwest, and the Golden Trout Wilderness to the south. In 1889 John Muir described himself as a "self-styled poetico-tramp-geologist-bot. and ornith-natural, etc.!!! ". John Muir spent his life advocating for the protection of the wild parts of the Sierra Nevada. He believed that public support for the protection of these lands would come about if more of the public experienced these areas and he formed the Sierra Club for just this reason. 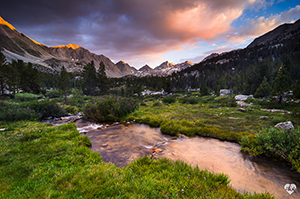 The John Muir Wilderness encompasses many of the lands that Muir explored in the late 1800's. From east of Fresno California in the north, the John Muir Wilderness forks around Sequoia/Kings Canyon National Park and extends some 100 miles to the south with its southern most boundary just west of Lone Pine, California. With an additional 70,411 acres added to the wilderness through the Omnibus Public Land Management Act of 2009, There are 650,734 acres within this wilderness. Elevations range from 4,000 feet to just below the Mt. Whitney summit at 14,497 feet. There are numerous peaks over 12,000 feet. Deep canyons, lofty peaks, meadows, lakes and expansive alpine terrain characterize this wilderness. The south and middle fork of the San Joaquin River, the North Fork of the Kings river and many creeks that flow into the Owens valley to the east originate here. The John Muir Wilderness is heavily visited and has use limits in the form of trailhead quotas on all the trailheads accessing the wilderness from both the east and west side of the Sierra Nevada. There are over 590 miles of maintained trails and the John Muir trail and Pacific Crest trail traverse portions of the wilderness. Many trails originating in this wilderness access the backcountry of Sequoia/Kings Canyon National Park. Planning to Visit the John Muir Wilderness? How to follow the seven standard Leave No Trace principles differs in different parts of the country (desert vs. Rocky Mountains). Click on any of the principles listed below to learn more about how they apply in the John Muir Wilderness.